There are quite a few samples of the new Recycler list component kicking around on the net. The problem is most of them are a bit too simple. Anyway, I have written a nice example which has most of the features you might want. Icon which changes according to the data. Multiple items on a row. Short and long click handling. // Hot re-load, false=will reload changes. * Add our static resources folder mapping. See the bits concerned with DEFAULT_CACHE. Copy these and you will find your changes reflected right away just like good old JSP! I haven’t posted anything in ages. I have been working away on various projects some of which were dead ends some of which might lead to something, we’ll see. Deleting the pubspec.lock file and redo ‘pub get‘. Deleting my package folders and redo ‘pub get‘. Trying ‘pub upgrade‘ in case that had some effect. None of these actions had any effect. I knew it had to be something to do with a local cache but I couldn’t find the folder as stated in the documentation. It does mention you can define a system variable PUB_CACHE to redirect the cache to where you want. So I created a system variable (windows) and set it to a folder under my user setting and then retried pub get‘. This time it worked perfectly. It is not clear to me what I did to break the ‘get’ mechanism. I wish I knew so I could raise an issue but in the meantime I hope this helps someone else with the same problem. I have been noticing that there are quite a few instances of my original port of Kento Chos esoteric shooter – Noiz2 available. It has made it’s way across the internet on various app stores mostly unchanged which is fine by me. A few people have added adverts. Good luck to them. Anyway, just to keep ahead of the game a bit I thought it was time to lavish some love on the noiz2 codebase and see if I couldn’t bring something new to the party. 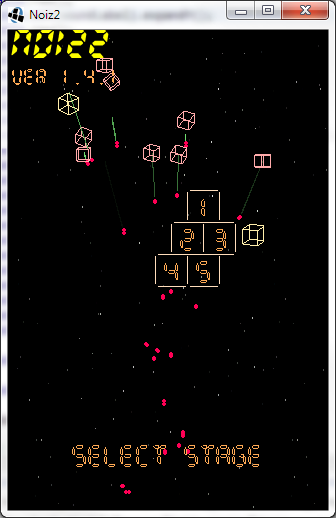 With this in mind I have mavenized it, ported it over to use LibGDX and put it up on Github. This took most of this weekend but I think I have almost got there. Minor tweaks to the GFX. Much nicer menu with a lot borrowed from the Simple Shooter demo. It is not finished. I have not wired the preferences or the persistence of what levels the player has completed. Also the Android platform hasn’t been added yet. The most interesting thing about the porting procedure was that it was pretty painless. I had abstracted the graphics and control elements previously as I had OpenGL and Canvas renderers available for the Android version. Wiring in the GDX elements was a complete doddle. Rewrite the ScreenGDX primitive renderer to be more efficient (I have yet to try this on Android). I have got persistence of the game state and some of the original setting like sound and volume working with the LibGDX ‘Preferences’ class. Not so hard after all. The settings screen is a little flaky though. I have also started to tidy up a lot of the game text which was a bit wonky looking. One thing to note is I have ditched the original bitmap logo as I just don’t think it looked very good. 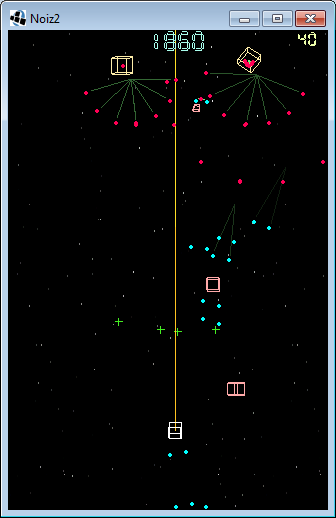 I am trying to improve the look and feel overall rather than go for a ‘classic’ port of the game. I have, after all, already done that. Added a nice menu. Can’t get it to run on Android yet. Working on Android. Looks good. Persistence of settings not working properly. I plan to fix this and then publish as an update. Here is a nice GWT and Leaflet map application I wrote to ease myself back into GWT again after not having written a line of GWT code since 2009. 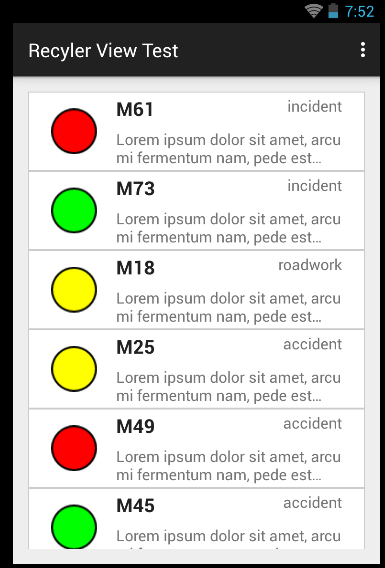 It is a classic map and list type site which displays some sample data I downloaded from the UK Highways Agency traffic RSS feed. Not content to knock something together just to get it working I have as usual done it the hard way by embarking on learning about GWT UIBinder and the MVP design pattern which Google are promoting in the latest version of GWT. My intention is to eventually write something bigger after getting up to speed on GWT again. 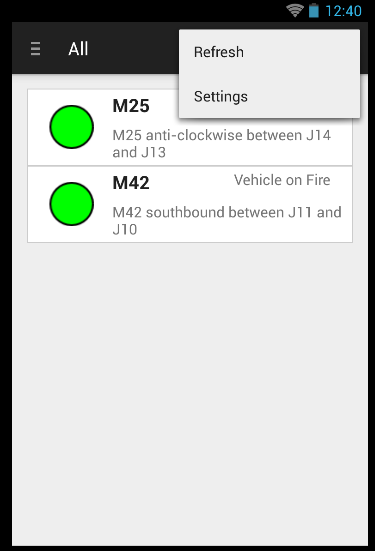 The result is a simple MVP application which utilises composite binder xml views and the GWT Leaflet map component. All mavenized for an easy(ish) build and deploy process. 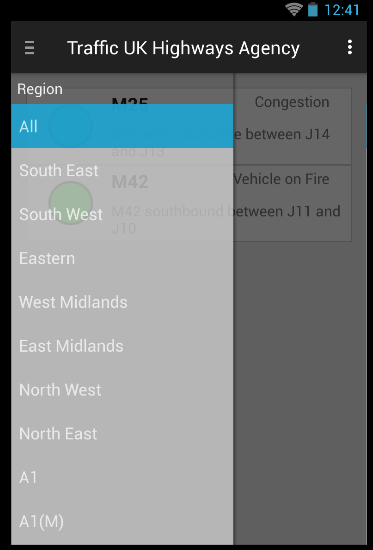 The data comes from the Highways Agency RSS feed here. This was downloaded and processed by my RSS parser which you can find here. I used the Google JSON library to convert one of the feeds to a JSON file which was my sample data. The map is the GWT Leaflet component. The component attaches itself to an g:HTMLPanel defined in the MapView.xml UIBinder template. You cannot instantiate the map control directly in the constructor of the binder. You won’t see anything. It has to be created and attached in the onLoad method of the composite view i.e. I couldn’t get the the ‘fitBounds’ method to work which I believe should set the view bounds and zoom to the data set. You must call ‘invalidateSize’ to force the map to redraw otherwise the map is kind of half-drawn. The whole view is actually a composite of the left, middle and right panels. I.e. I had bit of trouble trying to get the data table to do a single selection when a row was clicked. After a fair bit of Googling and hunting around stackoverflow I found that you cannot define this in the binder template CSS. The only was to get this to work was to define a CSS resource and pass it into the constructor of the DataGrid. * The keyboard selected cell is visible over selection. * Override the datagrid style resources.